I like the concept, but I had some problems with the aspect ratio cutting off my UI, so I couldn't tell how much health or energy I had. 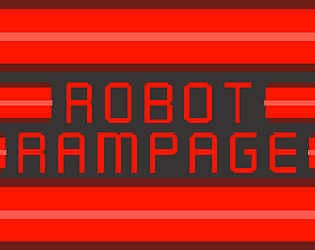 I also would have liked to see some in-game feedback that tells players that they can't hurt the robots, as a player who's just skimming the text could easily miss that detail. Neat concept! Tricking the enemies to walk near barrels so I could blow them up was fun. I like that you have to damage in order to shot, and that you have health regain to balance that. I'm glad you had fun, thanks for the feedack. Very nice for a first game jam, congratulations! I would try increasing the size of both visual queues and trying to synchronize them with progresive audio queues. Overall nice little game. pew pew! We appreciate the insightful feedback and will work on polishing the parrying mechanics to feel smoother and more responsive. Love the sounds and the music. There are some awesome aesthetic touches too, like the ceiling pipes. Mechanics are sound and enjoyable. The controls for the shield are a little clunky, the timing is difficult to get down. Other than that very good! Great job! I agree, we may have made the timing a little too short. very good game idea and execution I'm amazed. It will be nice from you if you checked my entry out and gave it a rating and feedback. Thanks for the review, and I'll be glad to check your game out. So it feels like a modern shooter game loop where you get into combat then hide to regenerate your health. Question story wise: does the dude take the bullets out of his body to reload his own gun with it?He looks like the kind of person to do that. The health regeneration was put in last minute. Originally the only way to heal was to parry (block the shot right before it hits).However, We added the health regeneration just to make the game a tad bit easier. Regarding your question about the story, in a way yes ,the character is supposed to be grabing the bullet. 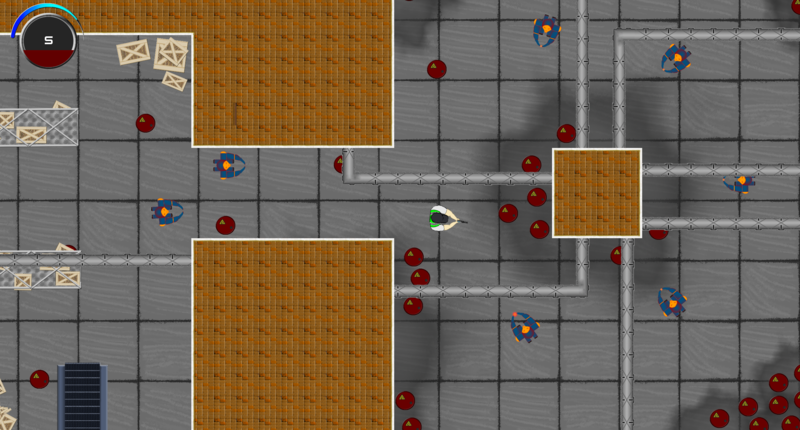 The idea is that the robots are shooting an energy based shot, and the player is using his shield to absorb the energy. He has a body shield that absorbs some of the energy and a deployable shield that absorbs more energy and can block damage. We have been made aware of an issue regarding the screen size. The game window might be too large depending on your screen size. To fix the issue hold down the Windows Key and press the UP Arrow Key to enter into full screen mode. You could also try the F11 Key. I can't move the window of the game and it's half outside my screen, also as soon as i started to play the game froze. What is your screen size? We may need to optimize the game for smaller screen sizes. Also did the game freeze when loading into the title screen, or when you hit play game? We have made the needed changes to resolve the screen size issue, however we cannot upload the update until after the jam has completed. Thank you for making the team aware of this issue.